The Western Pennsylvania frontier was truly wilderness a quarter century after the American Revolution when our Scots-Irish and English forebears settled there. According to his obituary, my Great-great grandfather John Dixon Hill was born in what is now Slippery Rock, Butler County, in 1824, to William (1799-1875) and Sarah Barber Hill (1797-1873). Little is known about them at this time, except that the descendants of older William Hill family (c.1740) had moved from Adams County to Slippery Rock and founded the community then named Centerville, Butler County. The younger William Hills then moved to Leesburg, Mercer County, PA, about 10 miles northwest, when John was “but a boy” (obit). They probably farmed near the Neshannock River along the Pittsburgh-Erie road, once an Indian path, now U.S. Rt. 19. John Dixon Hill enlisted the Army on November 20, 1862, and by age 38 he was off to fight for the Union cause. He was promoted to Captain with Company A, the 169th Regiment, PA Volunteers. 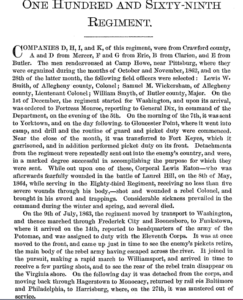 Read the story of their accomplishments in that awful conflict in Samuel P. Bates chronicles. See his “Record of the 169th” below. Today, our Grandfather John D. Hill’s name is on the Pennsylvania Memorial at Gettysburg. He may have been a surgeon’s assistant, and if so, he probably saw the very worst side of the war. He was honorably discharged on July 26, 1863, just after the retreat of the Confederates at Gettysburg. As an officer was entitled to unclaimed government land in Adams Township, southern Butler County, Pennsylvania. Tradition holds that he was able to obtain enough to give each of his four sons a farm. His obituary says that he taught school and clerked in stores until he started a business. We’re not certain what that was. John D., as he preferred to be called, had married twice, both women named Margaret, before going off to war. The first spouse was Margaret Stewart Thorn (1832-1855) in 1850. Two children came of that union, William Walter Hill (1851 – ) and Mary Anne (1853-1902). After the death of that Margaret, he married Margaret Sarah Marshall (1831-1915) in 1857, and they produced my Great-grandfather Joseph Marshall Hill (1858-1939). His brothers were Francis Leroy, John Wallace, and Quincy Adams, who lived only six years. Margaret Sarah’s parents were Joseph Marshall and his wife Elizabeth. Click on “Our Marshall Family Tree” for more information. We believe there is no connection to Marshall Township near Pine Township and North Park, where my Grandmother Bessie, their great-granddaughter, settled with her husband Bessie [see “The Settlement at Pine Creek”]. When Allegheny County took over that part of the world to create North Park in 1927, engineers formed Marshall Island, now a waterfowl sanctuary in a beautiful lake between the Ice Skating Arena and what was the old Pearce gristmill [see “Pearce Milling Company”]. According to Pine Township’s bicentennial booklet, early residents were Samuel Marshall, his wife, and six sons. A portion of their farm became the first Cross Roads Presbyterian Church and Cemetery founded in 1826. My familes, the Pearces and Moons, have five generations buried there. Another private place of rest in that area known as the Marshall Cemetery, now abandoned, has yet to be located. Take a virtual tour of the North Park area. So, Captain John D. Hill, returned from war to Butler County, PA, his second wife, and large family to farm, to teach, and to run a small business before his death in 1915. He was 91 years old. He and Margaret Sarah are buried in the first row of the Mars Cemetery. For more information and photos, see their Vitals. 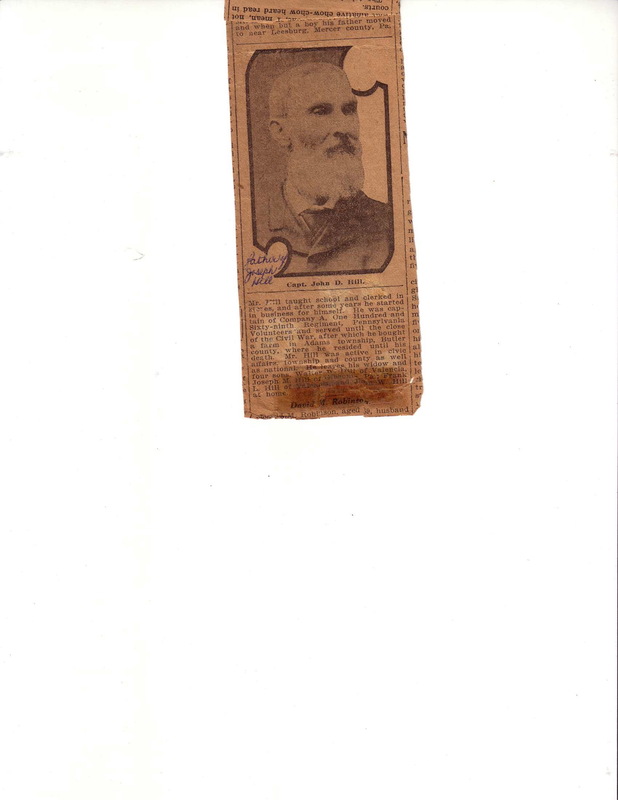 The Captain’s first child to his second wife was my Great-grandfather Joseph Marshall Hill (1858-1939) also married twice: in 1880 to Mollie Dunlap and in 1886 to my Great-grandmother Alice Virginia Moon [see stories in “Our Moon Family Tree”]. According to his obituary, Great-grandfather Joseph was a farmer and member of the Cross Roads Presbyterian Church. He belonged to the McCandless Township Volunteer Fire Department for 50 years. Their children included my Grandmother Bessie Reed, the oldest, and her sisters Myra, Hazel, and Mayme and brothers Charles, Carl, and Harry. Myra married Thomas Clarence Miller, who worked in the aluminum mill. Hazel married Alex Nicely, a plumber. She died giving birth to twins, Jane and Jean. Mayme married Hugh Russell Crummy, a minister. Charles and wife Martha Bonin farmed. Carl and wife Debbie were in the real estate business in Delaware. Harry also farmed, but married Hulda Fisher, a schoolteacher [see reference in “Faith of our Fathers (and Mothers): Part II”]. Joseph Marshall Hill and Wife Alice are buried not far from my father, their grandson, in the Allegheny County Memorial Park north of Pittsburgh. The land that was once the Hill farms now hosts thousands of new homes and condominiums, providing an ample tax base for the ever expanding Mars School District. Recently, we’ve begun a new segment of this website called “Cousins’ Corner” where we pay homage to, in this case, Hill relatives who have been tremendously helpful in our historical research. Have a look at Grace Hill TeSelle and the late Nettie Stark and Alice Drescher. Thanks to them and others, we are able to remember and honor our Hill family hero, Cpt. 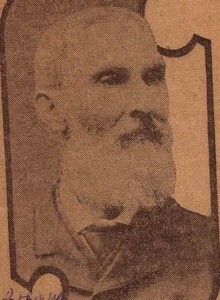 John Dixon Hill. Here is Samuel Bates’ record of Cpt. 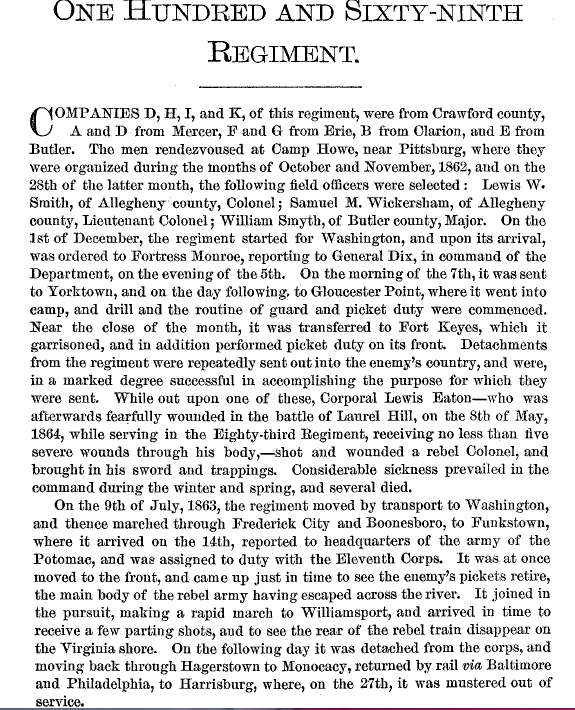 Hill’s 169th Pennsylvania Regiment (Vol. 4, page 1150). Click on image to enlarge. Looking for any connections to Dixon family from Fockingham County, NC. They originated in PA and came to VA and NC. Robert Dixon was great ancestor. My grandfather was Albert Percy Dixon. My third great Grandfather is John D. Hill. His first wife (Thorn) is my third great grandmother. Would you have more information about the two of them? Just FYI Mary Anne, John D.’s and first wife Margaret’s daughter, died in May of 1902. Thanks to you, I found information that she had a brother. I ran into a rut looking for information on John and Margaret (first one). Anymore Information would be lovely. Thank you so much for your time. 😉 I’m glad I can help. I found William’s (Mary Anne’s brother), burial place and death year. I also found his wife’s maiden name. According to U.S. find a grave, he passed in 1935. He is buried in the Mars Cemetery in Butler county, Pa. His wife’s maiden name is Galbraith. I noticed in your vital’s that you did have a name for Mary Anne’s husband. As you have probably guessed, Mary Anne is my 2nd great Grandmother. Mary Anne married Robert Thompson Love (1850-1903). They were married in 1870. They had a total of 9 children. Out of 2 girls and 7 boys, only one of the boys passed away on the same day he was born. They also had my great grandfather. http://www.findagrave.com/cgi-bin/fg.cgi?page=gr&GRid=24903185&ref=acom I hope this helps. John Dixon Hill was my great-great grandfather. I just stumbled upon this. I have a lot of pictures and his discharge from the military. He was stationed in Washington, D.C. to protect the capital during part of the Civil War. My grandmother, my uncle, and an aunt, Mary Brown, lived on the Hill farm. I spent a lot of my childhood there.